Grocery retailers in the United States could be doing more to address the issue of food waste, a new study contends. Of the 10 largest grocery companies based in the U.S. or with U.S. stores, nine don’t publicly report their total volume of food waste, according to “Checked Out,” a report released yesterday by the Center for Biological Diversity and the Ugly Fruit and Veg Campaign. Ahold Delhaize was the only one of the 10 companies — which also included Albertsons Cos., Aldi, Costco, Kroger, Publix, Target, Trader Joe’s, Walmart and Whole Foods Markets — that publicly reported this data. 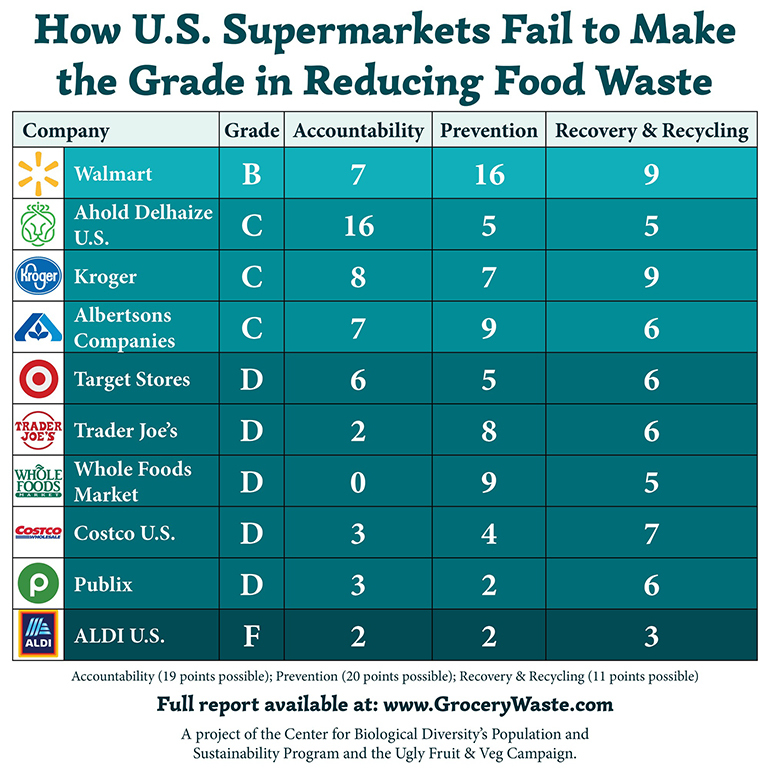 What’s more, the analysis gave five companies — Target, Trader Joe’s, Whole Foods, Costco and Publix — a D grade for their efforts to reduce food waste, while Aldi received an F. Walmart had the best food waste reduction grade with a B. Ahold Delhaize, Kroger and Albertsons earned C grades. Forty percent of the food produced in the U.S. goes to waste, and businesses serving or selling food account for 40% of that total, the report said. The chief culprit: retailers, which generate more waste than restaurants or foodservice providers, the study noted. “Food waste is a growing problem that squanders water and farmland, hurting wildlife and putting food security at risk. We can stop this massive waste, but only if supermarkets are part of the solution,” Jennifer Molidor, senior food campaigner at the Center for Biological Diversity, an Oakland, Calif.-based nonprofit conservation group, said in a statement. • All of the companies have food donation programs, with most operating companywide. Aldi was the only company not reporting a food recycling program, such as composting, animal feed or other industrial uses. “As the primary place where most Americans purchase food, supermarkets influence what makes it from farms to shelves, what happens to unsold food and even how much and what types of food shoppers buy,” the Checked Out report stated. For the analysis, companies were scored with points in eight areas: corporate transparency (tracking and publicly reported data), company commitments, supply chain initiatives, produce initiatives, shopping support, donation programs, animal feed programs and recycling programs. To spur retailers’ efforts, the report called on U.S. supermarkets to commit to eliminating food waste by 2025. Recommendations include time-based commitments to address food waste, with a goal of zero surplus food; tracking and publicly reporting the total amount of food wasted; corporate policies to reduce supply chain waste, such as whole-crop purchasing and selling ugly produce; sustainable seafood policies to eliminate bycatch; and policies to promote quicker, fresher, longer lasting food transport, packing and delivery. Retailers also are urged to leverage emerging technology with real-time analytics to better track temperatures and conditions of perishables and to engage in online and in-store initiatives to rein in overpurchasing, such as terminating buy-one-get-one-free models and providing meal-planning tools.